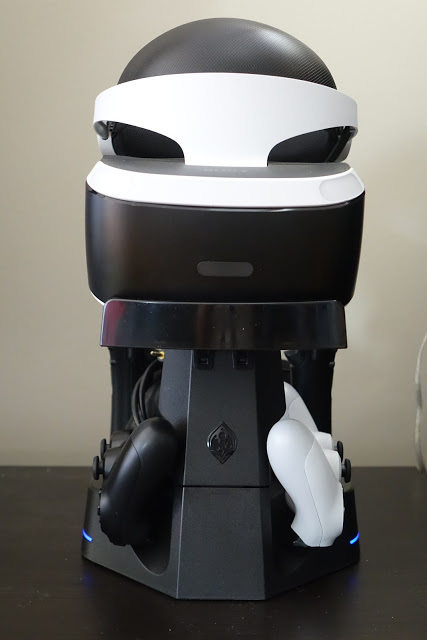 If you have a Playstation VR, this is the best display stand and charging station for it. 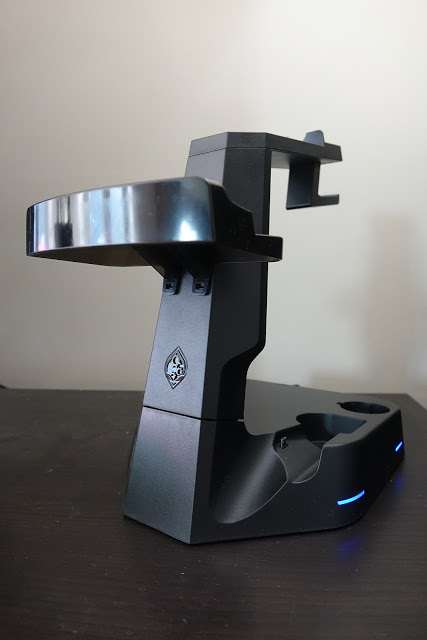 I finally received my Collective Minds stand, which I preordered a while back. 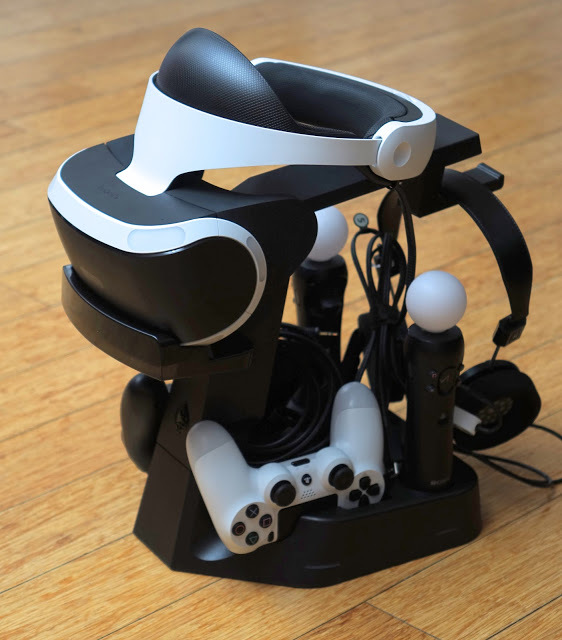 It’s not just a display stand for the Playstation VR headset, but it also holds headphones, and charges two Dual Shock 4 controllers and a pair of PS Move controllers. Other than the delayed availability, I think it’s a great product that so far has performed as advertised, and has been worth the wait. It comes disassembled, but it’s easy to put it together without tools. The only part that was a little hard to insert was the headphone support, which took much more force to insert than I was expecting. The stand is plastic but the base seems to be weighted and it’s quite stable. 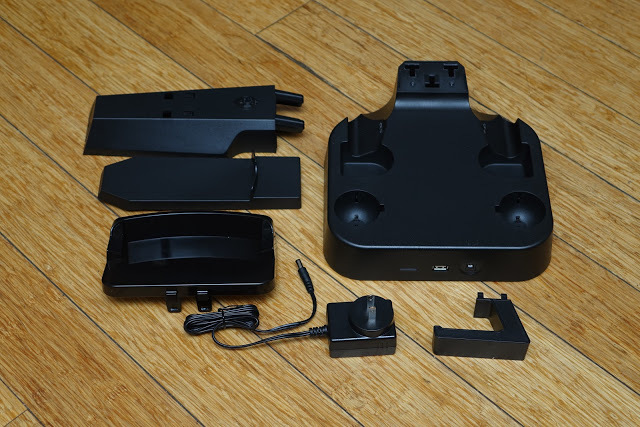 The stand includes its own AC adapter, so you don’t have to use any of your PS4’s USB ports to charge your controllers, but if you prefer, it also has a USB port that you can either connect to a USB charger, or to a PS4 USB port. 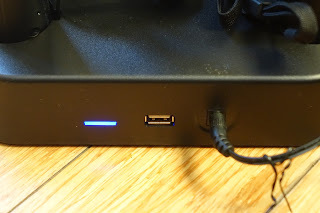 A blue LED light beside the USB port indicates whether the stand is turned on. 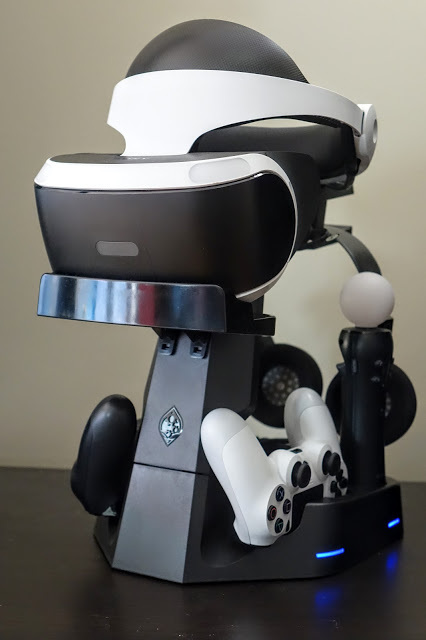 Placing the PSVR headset is easy, as is inserting the controllers. But you just have to make sure that the PS Move controllers click into place to make sure they are charging. With everything placed on the stand, the stand looks tidy, compact, and presentable. The stand’s base has individual LED light strips that shows whether each controller is charging (red) or fully charged (blue). The hue of the LED light matches the light from the DS4. I’m really happy with the Collective Minds stand. 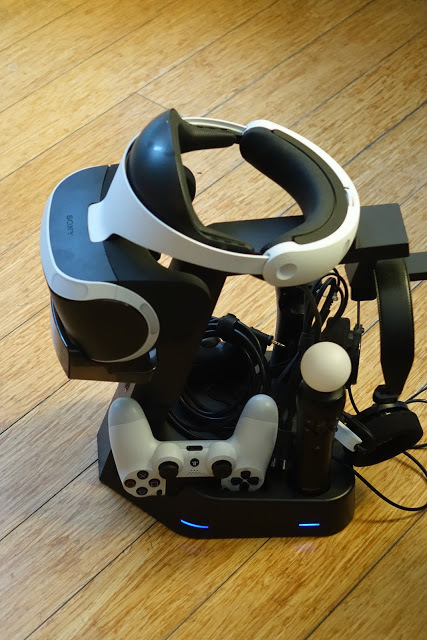 Compared to the Power A charging and display stand, it can charge one additional controller (the Power A charges only one DS4), can support a headphone (the Power A doesn’t), and actually costs 30% less. I was worried that with the lower cost and greater functionality, that it would be cheaply made or that it wouldn’t actually perform as promised, but nope — it looks good and functions just as I had hoped. My only gripe (besides the delay and limited availability) is that the included AC adapter is kind of short (around 3 feet). Highly recommended.